NEWPORT, RI--(Marketwired - Apr 13, 2015) - Nestled along the waterfront in the heart of historic Newport, Rhode Island, lies the charming Newport Marriott hotel. To welcome guests back after a $35 million renovation that took place during the winter months, this Newport, RI, hotel is offering three new spa and romance packages for guests seeking a revitalizing getaway to usher in spring. All three packages offer treatments at the largest spa in Newport, The Spa at Newport Marriott. This peaceful oasis provides eight state-of-the-art treatment rooms, a private relaxation lounge, and a full-service hair and nail salon. All packages require a 10 day advance reservation and are available Sunday through Thursday. At least a 10 day advance reservation is also recommended for the spa. Call the spa directly to book your appointment. 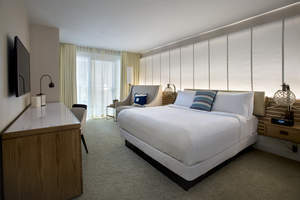 The newly reimagined Newport Marriott offers business and leisure travelers alike a unique Newport, RI, experience. A gorgeous Greatroom lobby with the day and night bar, the Plank, a new restaurant, Mainsail, featuring remarkable views and a dock-to-table menu, the Skiff Bar with a new outdoor terrace overlooking the harbor, nautically inspired guest rooms and an exclusive M Club Lounge lets guests immerse themselves in the Newport lifestyle. Our Newport, RI, spa offers luxurious treatments and services that guests will find transformative. Outside the hotel and spa, Newport's vibrant streets and enticing waters leave guests enchanted. For more information, to make a reservation or to submit request for proposal, call 401-849-1000 or visit www.NewportMarriott.com. Relax and unwind at Newport Marriott’s premier Newport spa. Take advantage of this exclusive spa deal and indulge in the luxurious amenities and first-class service that await you in our newly renovated Newport, RI, accommodations.